Book US or Canada hotels. Make money. Our cash rewards program is simple. 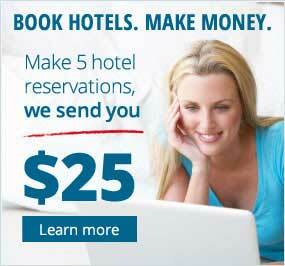 When you make 5 US or Canada hotel reservations, we send you $25. We write rewards checks to the person who makes the reservations. So whether you book hotel rooms for yourself or your business or organization, this is an easy way to earn extra cash. Rewards checks can be written to you or your organization  your choice. Make a hotel reservation through HotelGuides.com. When you have 5 confirmation numbers, email them to rewards@hotelguides.com, along with your name and address. We'll send you a check for $25. Repeat as often as you like! This program is an extra benefit. 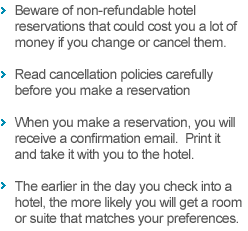 It will not reduce a traveler's hotel chain rewards points. Send confirmation numbers anytime after travel has been completed. These rewards do not expire. Cash Rewards is HotelGuides's affiliate program. Websites, businesses, organizations, and individuals can earn money through this program. Only one person can claim a reward for a given confirmation number. Canceled and "no show" reservations are not eligible for rewards. Reservations made through our group reservations service are not eligible, as this service has its own incentives. Any questions? Just write us at rewards@hotelguides.com.